God doesn't always deliver you from difficulties, sometimes he walks you through them. Hope everyone is having a wonderful Tuesday morning!!! Goodbye April and Welcome MAY!!! I'm sooo excited for all the plans I have this month. I have a few activities lined up and also going to be studying for my MCATs. Doing some big things here, so please pray from me. I need to stay focused on the task at hand. I'll still be posting, but just limiting the time I spend online. I've made my schedule and so far I'm sticking to it!! Everything is falling into place and I thank God for all that he's done. Enjoy the rest of the day Beauties!! OUTFIT OF THE DAY:This is actually Mondays outfit of the day. It seems like Cali is going through some mood swings, so yesterday was the last day of sun for this week. According to the weather, it'll be raining today, tomorrow and Thursday :-/ lol. That's alright though, because I have Rainy day outfits all set up! 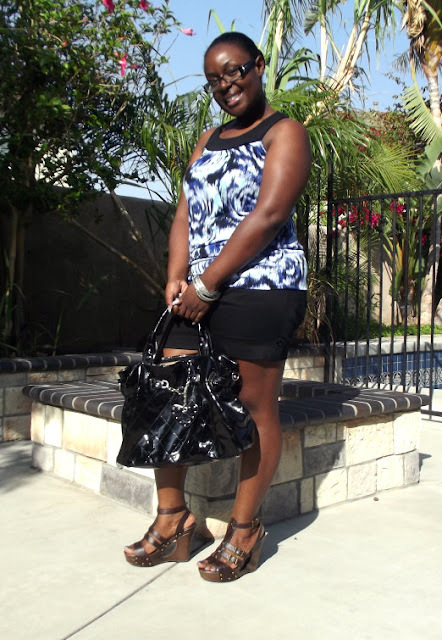 So Monday I wore Black cuffed shorts from Torrid paired with a blue patterned blouse and Soda cut out wedges. Perfect day for this outfit, not too hot and not cold. Hope you enjoy!! I love the skirt as well girl! Im in Cali right now, San Diego and the weather has been pretty weird..lol! Thnx my dear!! Im going to San diego this weekend...hopefully the weather is better by that time! That skirt looks so lovely on you, you look lovely lady!! Cute shorts!! Love the outfit! You look wonderful love! So chic.